SEB is a financial partner with a broad range of services. Our organisation reflects how we have both privates, small and medium enterprises, large corporates and financial institutions as customers. In the Baltics and Sweden, we have the broadest offering, and our operations in Finland, Denmark, Norway, Germany and the UK have a strong focus on a full-service offering to corporate and institutional clients. 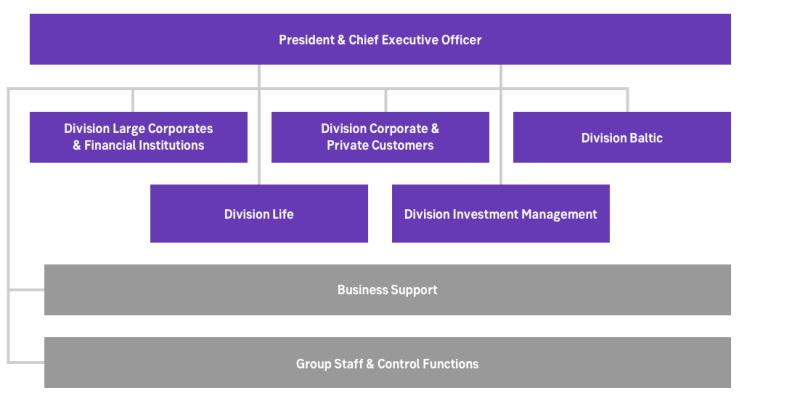 To fulfil the promise of world-class service, the bank operates through clearly defined divisions, each with a responsibility to act with commitment, simplicity and collaboration in the interest of the customers. The Board comprises solid knowledge and experience within banking and finance, insurance, asset management, fund operations, capital procurement, risk control, accounting, international industrial activities, small and medium-sized business, venture capital, entrepreneurship and leadership. The Board composition also meets the need for knowledge and insight regarding the conditions and prerequisites for business in the various geographic markets where SEB operates. To safeguard the interests of the Group as a whole, the President consults with the GEC on matters of vital importance or of importance as to principles. The GEC deals with, among other things, issues of common concern to several divisions, strategic issues, business plans, financial forecasts and reports. The Group Executive Committee meets at least twice a month.